Have you ever wondered how we know the Torah is true? What it means that there is a World To Come? That Hashem rested on Shabbos? Have you ever asked yourself WHY we do what we do? Too often we live our lives, not spending a thought on why or how the Torah designed our lives; how we are supposed to build a relationship with Hashem. Are our lives truly full of the joy and spiritual connection promised by the Torah? What can we do to fix this issue? There are people we secretly envy — people who feel Yiddishkeit deep in their bones, understand it, and are excited about it. People who love — and live — Torah. 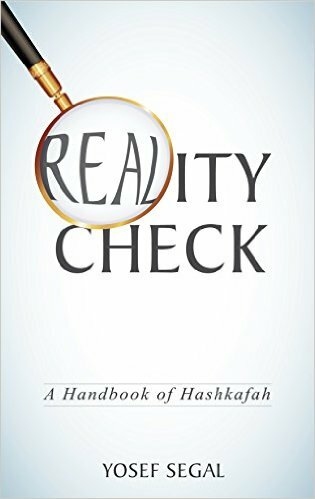 Reality Check: A Handbook of Hashkafa offers explanations of topics that every Jew must know, in a clear and concise manner. From the reason why we have mitzvos, to the significance of Shabbos, to understanding the spirituality of davening, this book is a must for anyone who desires a deeper understanding of Torah and mitzvos. Additionally, greater understanding is the best way to create a stronger relationship with Hashem. A deeper understanding of hashkafa allows us to connect with Hashem in a way otherwise unreachable. It allows us to transition from a relationship built on fear and awe to one based on love and understanding. We can then develop a stronger appreciation for the Torah, in place of performing mitzvos by rote. So let’s seize our destiny instead of stumbling around. Let’s absorb the lessons of the Torah and become more real. What can we do to become a little more real? The first step is to get greater clarity on why we do what we do, and how it all fits together. The first step is Reality Check: A Handbook of Hashkafa.